It is an integrated township spread in a total land area of Ac. 10 - 13 Gts, consisting of independent triplex luxury villas and apartments. Apartments alone occupy about Ac. 7 - 00 Gts, and are subdivided into Studio Flats, 1BHK, 2 BHK and 3 BHK Flats. 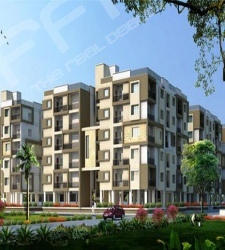 3 BHK - 1450 to 1645 sq.ft. PARKING: Parking in apartments is spread in cellar and stilt floors. •	Club house with gym equipments. •	Multipurpose hall in club house. •	Lounge and cafeteria in club house. •	Wi - fi zone in club house. An Infrastructure Development firm, Sumashaila Developers is one of the Hyderabad’s elite construction companies. The firm is a hybrid formation of multiple facets, each being a proficient in the respective field. The associated persons are pioneers in the arena of Real estate and land development activities, Building Constructions, Roads, Bridges, Mining and Business Administration.